Shaping Spaces is a project that intervenes within an environment or space to enable private conversations within a public setting. I completed this 6-week project during my second year at CMU under Stephen Stadelmeier and Austin Lee. This is an experimental piece that combines my study of scale, form, construction, and human-centered design within physical environments. As my concept cannot easily fit into an actual space due to its size and form, I used Photoshop to insert the model into an actual space in order to get a better understanding of the possible experiences and conversations one may have while using it. As my final design to-scale would have been nearly 17 feet long, I decided to physically model a section of it. This segment embodies some of the essential characteristics of the artifact, including the opening or window, curviture, height, etc. My reasoning for a longer form (seen in my smaller scale models below) was to create various intimate conversational sections, separated through the natural curves of the installation. The final phase of the project involved constructing a life size model of our object in order to feel its effects on people using the space. My small scale model was constructed out of modeling clay and my large scale model was constructed with flexible corrugated cardboard and hot glue. It was a very interesting experience to see how people reacted to the experience of using my large scale model, as people intuitively sat down in order to feel the atmospheric effects that the window and curved walls create. 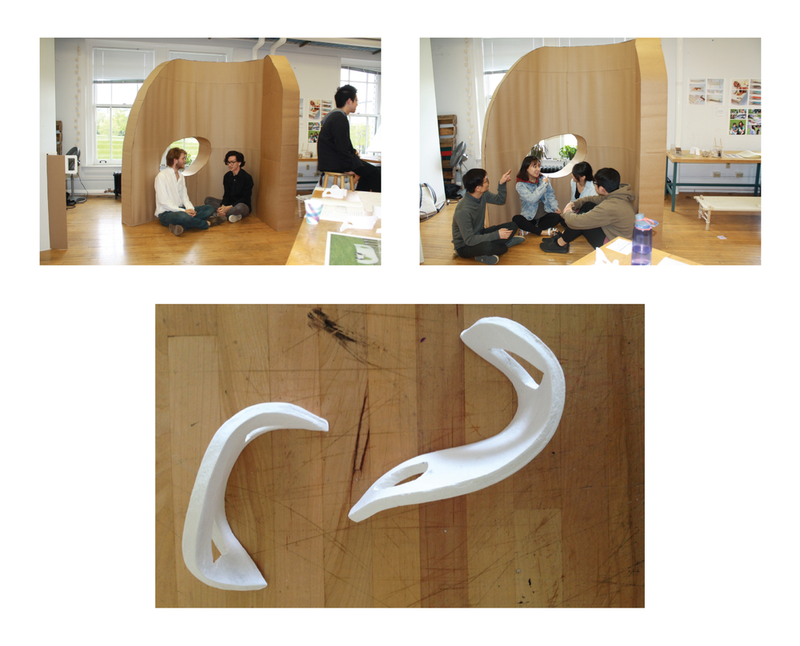 During the later stages of the project we explored different concepts and configurations of an object that could intervene in a particular space and bring qualities that we found useful or enjoyable from another space. I explored an eating area in our university center that was divided and partitioned in interesting ways and overlooked our pool area. With this, I tried to bring the elements of privacy, corners, and awareness of surroundings in order to add a level of comfort and safety for people trying to have private conversations within a public setting. The first phase of this project involved visiting different locations on campus and getting a sense of their public and private attributes. This exercise enabled us to get a sense of the kinds of human interactions that took place, and if the space either encouraged them or discouraged them from happening. I looked at an eating area in our Cohon University Center; specifically an outside seating area protected by hedges and trees, and an eating/sitting/working area next to the tennis courts.